Gorgeous pink color with cherry and raspberry aromas on the nose, and on the palate, more raspberry fruit and herbal notes, hints of that lovely green pepper synonymous with cab franc, and a medium body with a succulence that makes you weak in the knees. I am in love with this rosé. And then we found a few bottles of the 2012 our Alabama distributor had stashed away in their warehouse, likely forgotten. I wanted to taste it, to experience what a superb producer's vino, even a rosé which is always recommended to be drunk young, might do with a couple years of bottle age. Keep in mind, this distributor's warehouse is temperature controlled, so I figured it was going to be in the best shape possible. 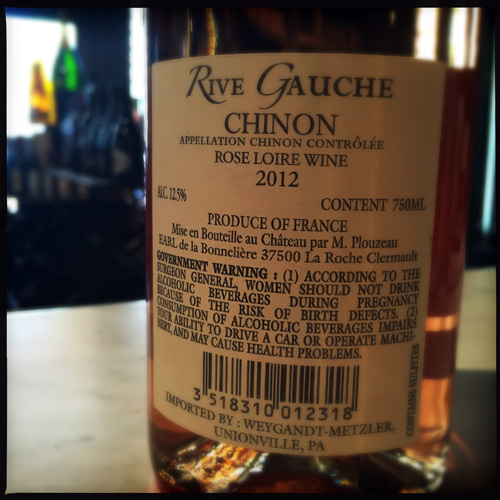 The M. Plouzeau Chinon rosé 2012 is a different beast than it's younger sibling. The fruit is almost non-existent, replaced with a nuttiness on the nose and palate and a hint of white balsamic vinegar, which is technically a fault or a sign of over-the-hill wine. Yet the acidity is still present, the finish long and sumptuous and of the four of us who tried it, everyone wanted more. The green bell pepper notes have mellowed significantly, taking a back seat to a marinated roasted red bell pepper quality (again, the hint of vinegar). It's austere and unapproachable and deeply captivating. Still, two years difference shouldn't change a wine so swiftly from fresh and bloom pink to a fruitless orange-hued old man. Vintage may play a part in this. The 2012 yield in the Loire Valley was horrendous for many, especially for the cabernet franc and cabernet sauvignon grapes, which are the stars in Chinon. Rain early on and through mid-July prevented the vines from properly flowering. Since each flower produces one grape, the bunches and total yield were reduced. Then in October, during harvest, the region saw 10 inches of rain (30 inches is the annual average), causing rot in some cases and further reducing yields and overall quality. The white wines of Sancerre and dry Vouvrays did not suffer as much from the poor weather. On the flip side, the 2014 vintage across the Loire, while seeing lower yields in Muscadet and throughout Tourraine, was incredibly easy. Pretty much everyone made great, delicious reds. Anjou, Chinon, these are going to be juicy with great acidity and infectious flavor. If I can get some more of the 2014 rosé I'd like to put a couple of bottles away for two years to see how evolves. My bet is it will have more fruit than the 2012 and keep a bit more of its blush color. Our North Alabama retail partner, The Carriage, does have a few bottles of the 2012 available, and I highly recommend it to the curious minded. As I mentioned before, despite the wine's clear diversion from the expected bright, cheery pink, we all loved it and reached for a second glass. Sometimes you need an eccentric in your life, a glimpse at the complexities of personality. And wine.